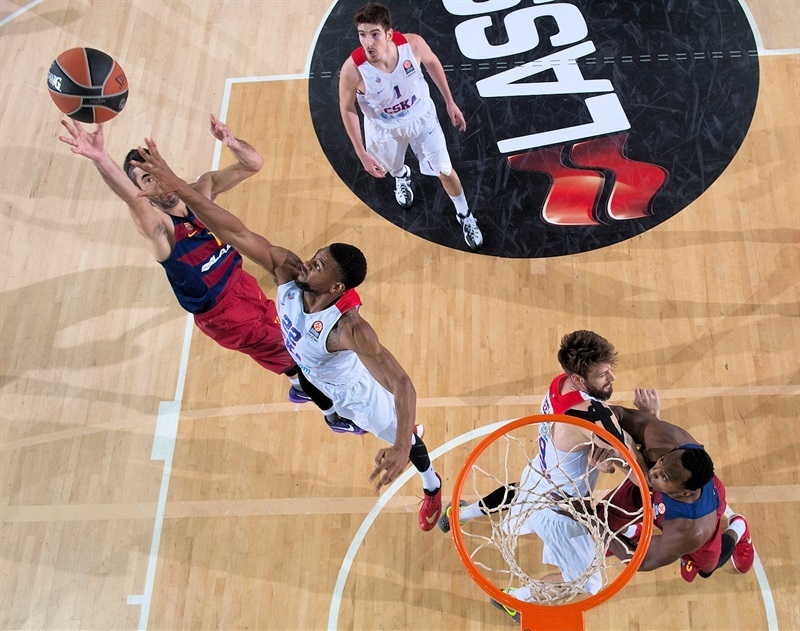 Doellman's heroics let Barcelona stop CSKA in OT! 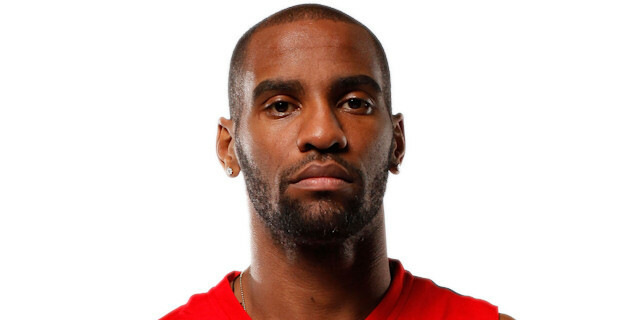 In a miraculous final 10 seconds, Justin Doellman grabbed victory from the jaws of defeat as FC Barcelona Lassa revived its playoffs hopes by shocking CSKA Moscow 100-98 in an overtime thriller on Friday. Doellman hit a three-point shot to tie the game with 4.4 seconds left, then stole and buried the game-winner with 1.5 seconds remaining to lift Barcelona to a crucial victory that had looked impossible just moments before. Barcelona raised its record to 5-5 and ties Khimki Moscow Region for Group F's fourth and final playoff spot. 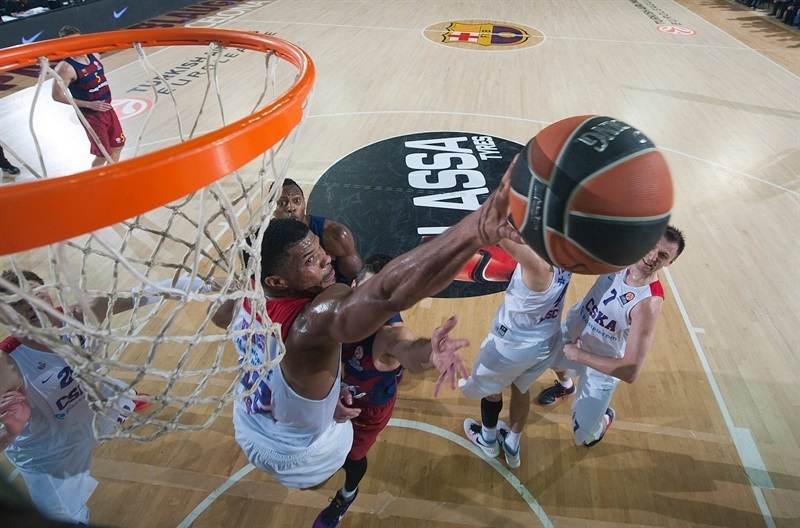 CSKA fell to 7-3 and a first-place tie with Laboral Kutxa Vitoria Gasteiz, its next opponent. 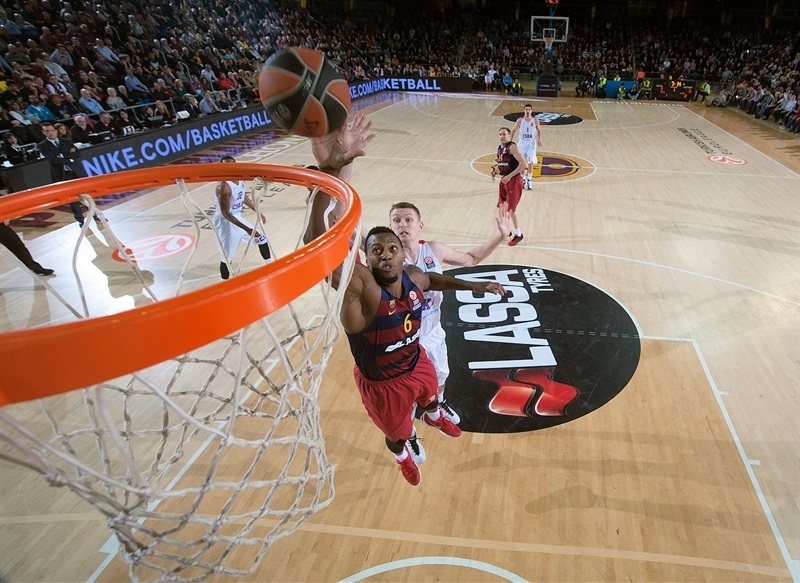 Barcelona led 47-38 at halftime, but CSKA roared back to go up 70-79 with under 5 minutes left in the fourth quarter. Ante Tomic and Carlos Arroyo shared Barcelona's next 13 points before Tomas Satoransky sent the game to overtime with free throws. CSKA led by 91-95 in OT on Milos Teodosic's three-pointer with 1:26 left, and by 95-98 after he sank free throws with 10 seconds remaining. 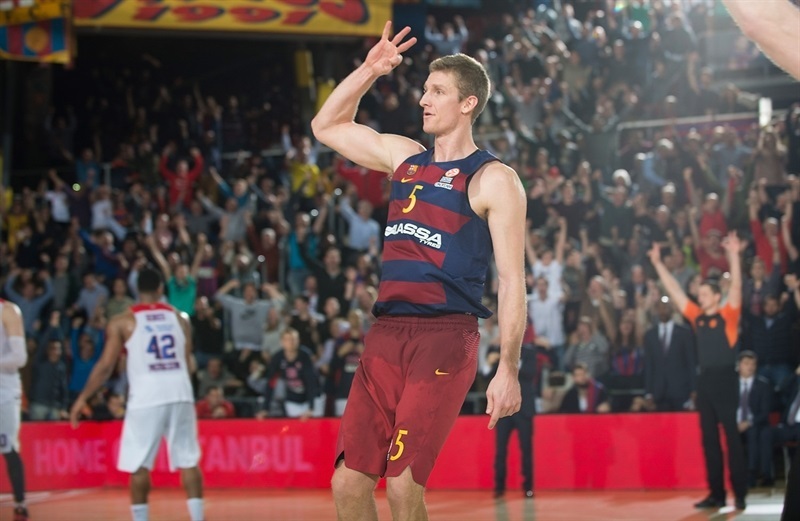 But Doellman only needed half of that time to make game-tying and game-winning shots that will be remembered a long time in Barcelona. Tomic led the winners with 21 points, while Satoransky added 19, Stratos Perperoglou 15, Doellman 12 and Juan Carlos Navarro 11. Doellman was the game's top rebounder with 10, too. 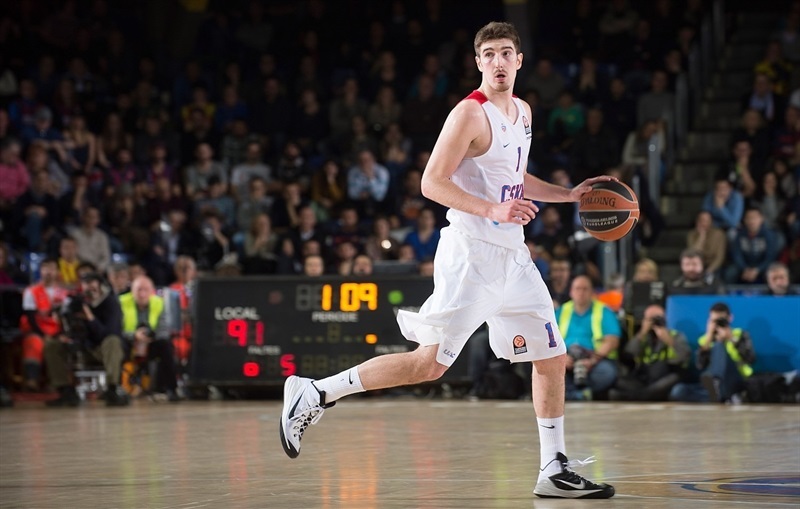 Nando De Colo exploded for a career-high 30 points to go with 7 rebounds, 3 assists and 2 steals for CSKA. Teodosic was right behind him with 23 points, 8 rebounds and 6 assists, while Kyle Hines scored 17 points and Andrey Vorontsevich 15 in a losing effort. 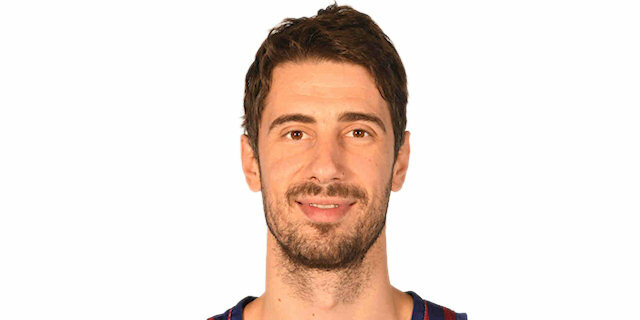 Justin Doellman got Barcelona going with a three-pointer from the right wing but De Colo struck twice from downtown for a 3-6 CSKA lead. Just as in the game in Moscow, CSKA started Ivan Lazarev at center, this time to guard Joey Dorsey down low. Satoransky joined the three-point shootout before a one-handed floater by Vorontsevich put CSKA back ahead, 6-8. Satoransky hit another one from beyond the arc, De Colo quickly scored in penetration and Joel Freeland dunked to boost CSKA's lead to 9-12. Doellman slammed after a midcourt steal and Perperoglou bettered Freeland's turnaround jumper with a three-pointer. A wild fastbreak slam by Satoransky restored a 16-14 lead. Tomic split free throws but Teodosic nailed both of his and added a layup for a 17-18 CSKA lead. Perperoglou scored down low and Pau Ribas matched Hines's close jumper with foul shots. A put-back layup by Hines and a buzzer-beating fall-away jumper by Vitaly Fridzon gave CSKA a 21-24 edge after 10 minutes. Perperoglou shined with a backdoor layup early in the second quarter that Brad Oleson followed with a triple to put Barcelona back ahead, 26-24. Perperoglou kept pacing the hosts with consecutive fastbreak layups that forced CSKA to call a much-needed timeout at 30-24, after a 9-0 run. Teodosic buried his trademark catch-and-shoot three-pointer from the top of the key, Tomic scored in the paint and Hines brought CSKA a bit closer, 32-28. Tomic shined with a big basket in the low post but De Colo hit a technical free throw and Nikita Kurbanov nailed a baseline jumper for a 34-31 score. 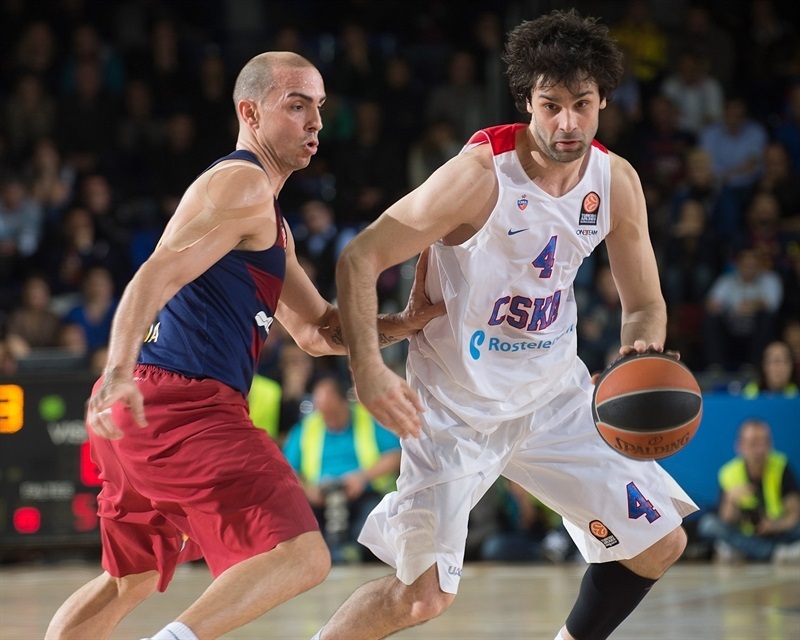 Teodosic buried a mid-range shot which De Colo followed with free throws to complete CSKA's comeback, 34-35. 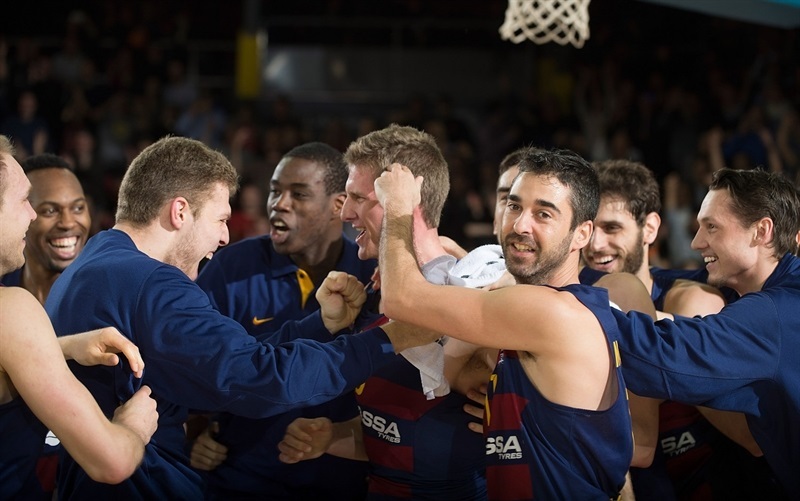 Navarro stepped up with a three-pointer and Oleson downed a jumper for a 39-35 Barcelona edge. Freeland split foul shots and De Colo scored down low but three-pointers by Oleson and Navarro boosted the hosts ahead by 45-38. A final basket by Satoransky - illegally blocked by Hines on its way down - fixed the score at 47-38 as both teams headed to the locker rooms. 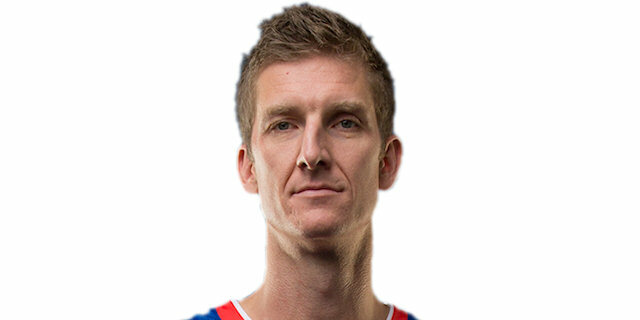 De Colo hit a mid-range jumper immediately after the break and Hines added a one-handed dunk to get CSKA within 47-42. 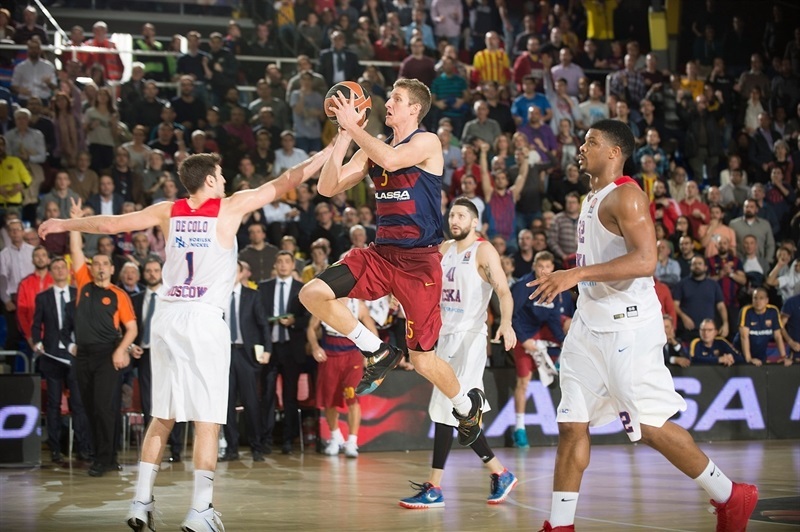 Doellman and Hines traded jumpers and Tomic banked in a close shot to keep Barcelona way ahead, 51-44. Teodosic followed a running jumper with free throws to make it a three-point game, 51-48. Tomic hit foul shots that Hines matched with a put-back layup. Satoransky and Kurbanov exchanged layups but De Colo got CSKA as close as 55-54. Satoransky ignited the crowd with a bomb from downtown but Vorontsevich found De Colo for a layup to keep CSKA within 58-56. Satoransky took over with a follow-up layup but Vorontsevich bettered that with a triple and De Colo added a put-back basket that gave CSKA a 60-61 lead. A red-hot Vorontsevich insisted from downtown to boost the guests' margin to 60-64 at the end of the third quarter. Fourth quarter: Down to the final seconds! Joey Dorsey sent the crowd to their feet with a two-handed slam early in the fourth quarter. 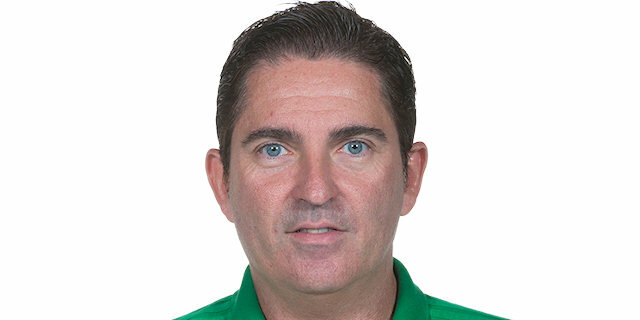 Fridzon quickly answered with a driving layup that Navarro improved with a three-point play that kept Barcelona within 65-66. De Colo shined with a wild driving layup that Navarro matched with a one-handed floater, his "la bomba" shot. Hines and Dorsey split free throws and an acrobatic layup by Carlos Arroyo let Barcelona regain the lead, 70-69. Teodosic stepped up with back-to-back layups and a three-pointer by De Colo gave CSKA fresh air at 70-76, with under 6 minutes left. Vorontsevich beat the shot clock with a critical triple that capped a 0-10 run for the guests. 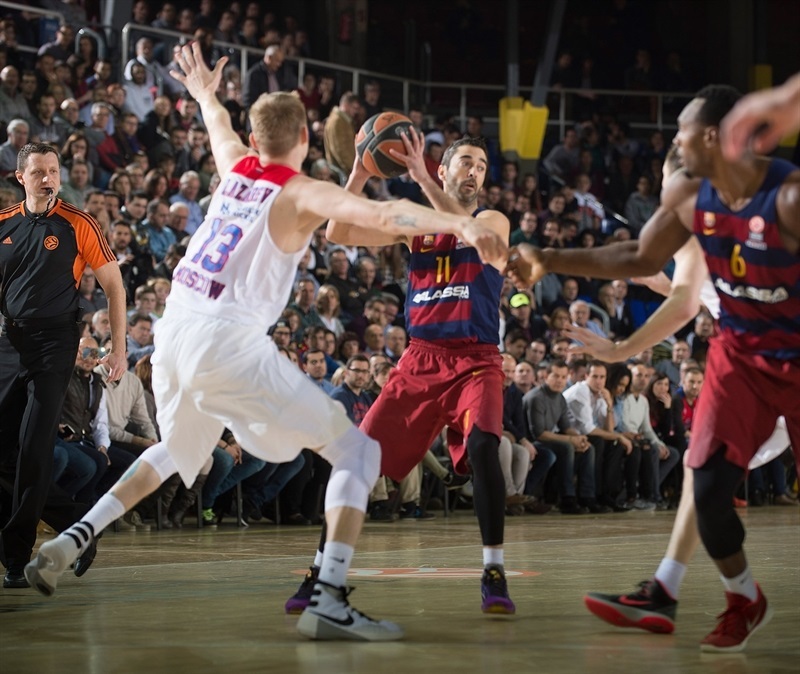 Arroyo hit a close jumper and Tomic added free throws to give Barcelona hope at 74-79. Vorontsevich and Hines made free throws but a layup by Tomic kept the hosts within 76-82. Vorontsevich - who else? - scored down low but Arroyo did better with a triple. Tomic scored around the basket in the next-to-last minute, De Colo and Teodosic missed at the other end and free throws by Arroyo brought Barcelona within 83-84 with 14.2 seconds to go. Hines split free throws and CSKA fouled Satoransky with 10 seconds left. He hit both attempts and Teodosic missed from downtown seconds before the final buzzer. Overtime: Doellman decides it in the last seconds! Hines shined with a layup-plus-free throw early in overtime and Teodosic added a free throw for a four-point CSKA lead, 85-89. Tomic made free throws, however, and Perperoglou added a layup that tied it again, 89-89, with 3 minutes left. CSKA struggled to score for 2 minutes until an open corner three-pointer by De Colo put the guests back ahead, 89-92. Tomic returned to the foul line and hit both attempts but Teodosic did better with a wild bomb from downtown for a 91-95 CSKA lead in the next-to-last minute. Tomic came up big with a reverse in the low post before a free throw by De Colo kept CSKA ahead, 93-96, with 19 seconds left. Perperoglou and Teodosic exchanged free throws before Barcelona got the ball back with 9.5 seconds left, after a timeout. Arroyo found Doellman open and he nailed a three-pointer to tie with 4.2 seconds left. CSKA was out of timeouts, so when Teodosic tried to inbound to Hines, Doellman intercepted the pass, picked up the ball and nailed the game-winning jumper. 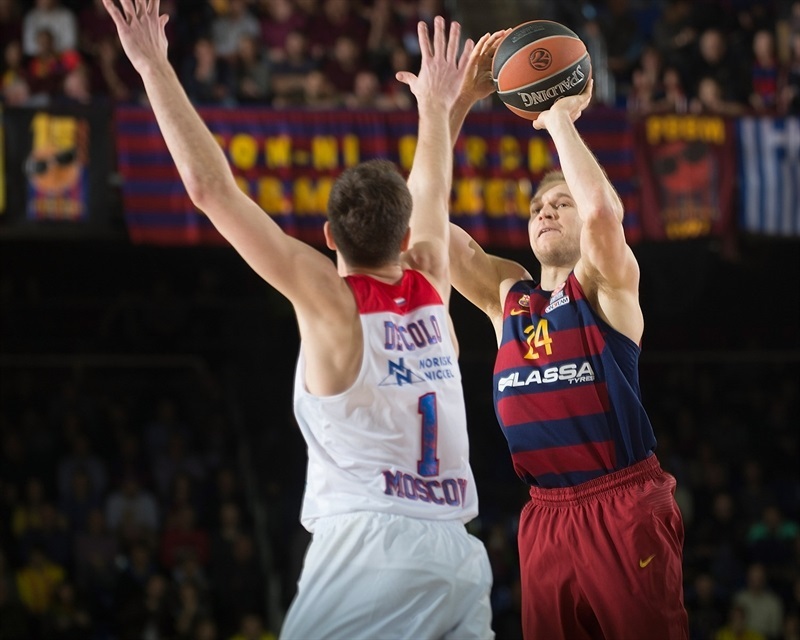 CSKA failed to score at the buzzer to conclude a truly unbelievable night at Palau Blaugrana! "Amazing game. Very beautiful for the fans. And we are very happy for this win. Congratulations to our fans. I would like to thank them for their support and the amazing basketball atmosphere we had. My players gave everything they had, there was nothing left in the tank. They put it all in the floor, playing with maximum intensity and good concentration in a difficult game. We fought, never looked back and believed we could win. That faith allowed us to force overtime and win the game. We played really well in the first half, but had a bad start in the third quarter, and we paid a high price for that throughout the second half. We saw our lead erased in five minutes and it was a different game. We didn't give up, though. Vorontsevich played really well and almost broke the game, but we kept our chances open. It was a very beautiful game to watch. I am sure it will be one of the best games of the season. We looked for Justin off a timeout and everything worked well - a nice pass from Arroyo for him to shoot the three. We put pressure, closed the passing lines and Justin had a lot of intuition, hitting a fantastic shot. We were celebrating and De Colo had the chance to score, there was 1.8 seconds left. Still, we are happy with the final outcome." 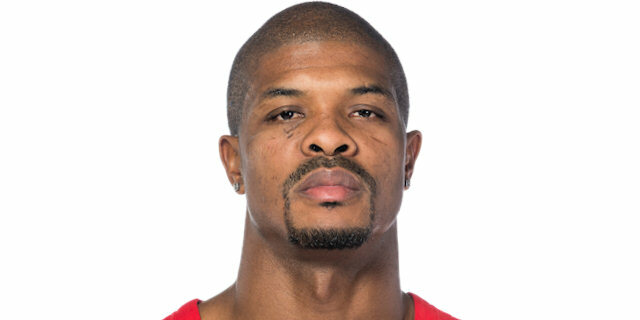 "Kyle [Hines] said everything about the game and how it went. We dominated in the first quarter, did what we wanted, and had many turnovers in the second quarter. They opened it with a 9-0 run and we were limited to just 14 points. We showed character in the third quarter and in the second half, on offense and defense. We came back strong, took the lead and pretty much had the lead until the end of regulation. We had the ball to win the game at the end of regulation and it was pretty much the same in overtime. We made crucial mistakes, gave up open looks, but this happens in such a tough game. We will come out of this stronger, smarter, more focused and more dedicated. This is a competitive group, a competitive league. Congratulations to Barcelona for the win, I give them credit. We will continue tougher, stronger and smarter for our next game." "It was a pretty intense game. I think we saw very good basketball from both teams. We fought, gave everything and deserved to win today. I only saw Justin's first basket, I didn't see the second one. I don't know what happened! I guess he stole the ball and hit a quick shot. It is incredible, I don't know what to say. Hitting two shots in such short period of time is unbelievable. The most important thing is that we won and have options to make it to the playoffs. Every win is important and this one has to give us a boost to keep winning." "It was a great game, it really had everything and we really needed to get a win like this, in overtime. The interaction with our fans at Palau Blaugrana was great. I would say that you always have to keep the faith and think you can win. Justin was awesome in the end and now we have to move forward with a lot more confidence, and I hope to have a great atmosphere against Real Madrid on Thursday. I have seen a lot of things in my career, but you don't see things like this any often - and it is great that we got the win in the end!" "Incredible feeling. There at the end, my teammates found me. I was able to hit that three, tied the game. And was able to steal the ball and hit the game-winner. Anything's possible. You have to believe until the end. God gave me that one, and thank god for the ability to play. It's a big victory and it keeps us in the hunt. We'll see what happens. Heckuva atmosphere. These fans are great tonight. It was a lot of fun... Carlos found me to hit that three-point shot and ie the game, then got the steal and hit the game winner! It is the second time I hit a game-winner this season and it is a great feeling to celebrate it with my teammates. It is a lot of fun to be out there. It was a matter of faith, of course. It was a very incredible game, very physical and everybody contributed. We proved we can play with everybody. This win gives us the opportunity to continue to play. It gives us one more win, gets us closer to the playoffs. We still have a lot of games left." "It was a tough loss. We had many turnovers in the second quarter, but improved in the third quarter, in which we had the opportunity to do our proper plays, our correct plays, which is positive for us. It was a tough ball game and I have to give credit to Barcelona for fighting, but the loss was on us. We made critical mistakes at the end of the fourth quarter and overtime to let the game slip out of our hands." "It’s not a definitive loss, but we take every loss personal, especially when we fought so hard in the second half to come back and win the game. We kind of messed up a couple plays towards the end of the game and they took full advantage of it. We gotta give big credit to Barcelona, they were really resilient and made big plays to win the game. "